1971 Topps Lew Alcindor #100 PSA Mint 9. High-grade example from the 1971 Topps Basketball release features Hall of Fame legend Lew Alcindor before his personal journey evolved him to Kareem Abdul-Jabbar. Very nice and almost perfectly centered. Graded PSA Mint 9, one of thirteen in mint with a trio grading higher. 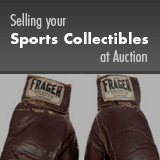 Only 38 days left to consign to the 2019 July 18 - 19 Summer Sports Catalog Auction !